On October 1, 2015, the U.S. healthcare system transitioned from the International Classification of Diseases, 9th Revision (ICD-9) code set to International Classification of Diseases, 10th Revision (ICD-10). Available on the Cook website is an ICD-9 to ICD-10 crosswalk for select procedures in which Cook devices are used. This master list includes coding information that can be quickly accessed from the table of contents. Coding and reimbursement guides will have ICD-9 content removed for the 2016 update. 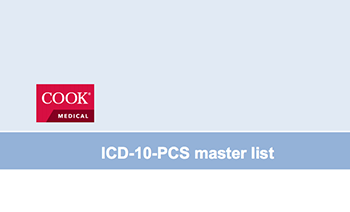 The change to ICD-10 does not affect CPT coding for outpatient procedures or physician services.